Last year, my family and I went to Orlando for Fall Break. My wife did the same trip with the kids the year before and enjoyed it so much, that she wanted to repeat it. So, we loaded up the minivan and road-tripped, Griswold-style, to the real-life Wally World. 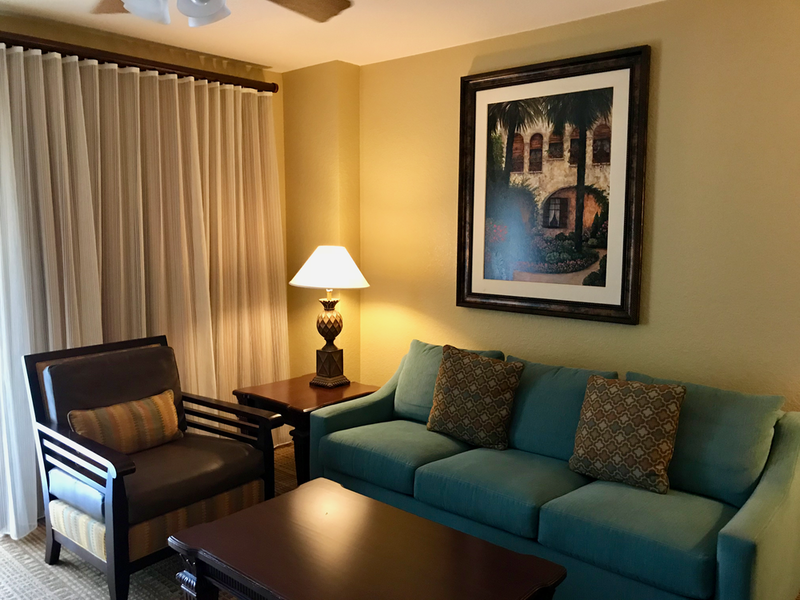 We stayed at the Wyndham Bonnet Creek Resort and, today, I review the condo where we stayed during our visit. As I have written about, I love trip planning, but my wife took the lead on making the arrangements for our Fall Break vacation. She was the one who found the Bonnet Creek property the previous year, so we simply booked again via VRBO.com - no loyalty points, unfortunately - for six nights from Saturday through Thursday. If you are not familiar with VRBO, it is similar to Airbnb in that it lets owners rent out their property to travelers. The Wyndham Bonnet Creek is a timeshare property but they also offer short term rentals via VRBO. My wife’s reservation request had to be accepted and approved, which occurred without issue. After that, things were much like staying at a hotel-based resort. We arrived Saturday shortly after 3 p.m. After stopping momentarily at the entrance guard shack, we headed to the building directly ahead to the Visitors Center where reception was located. We parked and headed in with our entire entourage - myself, my wife, her mom and three boys. While Mrs. Debrian Travels went to check-in, my mother-in-law, the kids and I checked out the reception lobby. It was a large spacious area with the main desk ahead and to the left. A small shop with convenience store type items and a limited selection of Starbucks items was located to the left in the entry hall. (Just a note, the coffee offerings were priced insanely high, even for that brand!) With its ornate columns, coffered ceilings and chandeliers, the lobby made me think of those of some Las Vegas hotels. 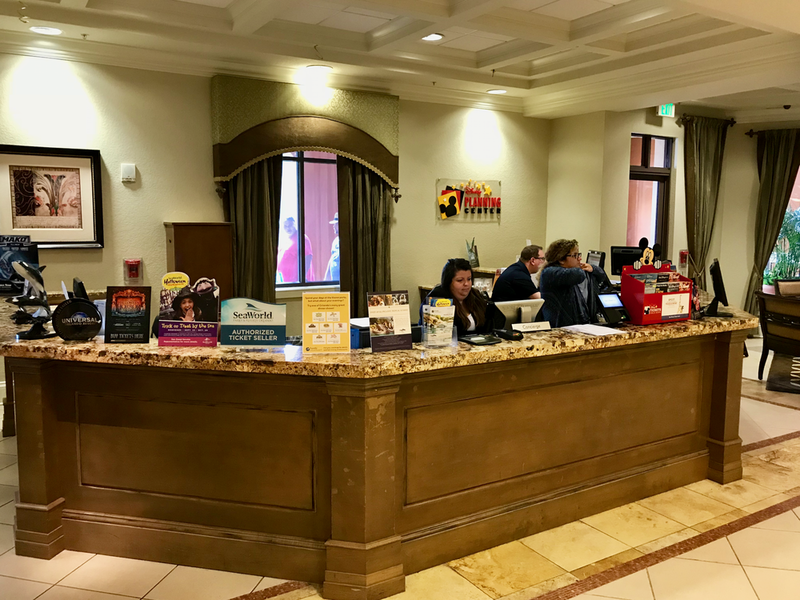 A desk that handled ticketing for various attractions in the area such as Disney World, Universal Studios and SeaWorld was along the far wall. There were several clusters of seating and just outside was a patio seating area with sets of tables and chairs. While my wife finished registration and arranging for our Disney tickets at the ticketing desk, the rest of us took a seat. Pretty soon, we were set to head to our condo which was in a separate building. Our condo was in Tower 5, two buildings down from the Visitors Center, so we all piled back into the van and drove over. We pulled into the front driveway, unloaded our bulky items then parked. Surface lot parking was often tight with few if any spaces available throughout our stay. Fortunately, our building was conveniently located directly across from a parking deck where spaces were always available. We were assigned a second floor unit on the corner , so we were at the end of the long main hall to the left of the elevator lobby. After stepping inside, I quickly saw part of what my wife liked so much about her previous visit. The condo was spacious, larger than my last apartment before we got married, and it was very nicely appointed. The main common area that made up half of the unit included the dining area, kitchen and living area. The dining area was immediately to the left of the entrance and included a long dining table with space for six. The kitchen was adjacent and offered all the basics: full-size refrigerator, dishwasher, range, microwave, coffee maker and toaster. The kitchen was stocked with a nice selection of dishes, utensils and kitchenware. After a grocery run to a nearby supermarket, we were able to prepare breakfast and lunch everyday along with dinner on a few days which helped keep the food budget for our vacation reasonable. Separating the kitchen from the living area was a breakfast bar with seating. The living area featured two armchairs, a sofa and a big-screen TV. The sofa and chairs looked more comfortable than they were, but they were more than adequate. The outdoor balcony was off the living area. While I enjoy sitting outside, the view was disappointing given our low floor and the fact that we were staring directly across at the concrete wall of the parking garage. In the far left corner of the living area was the door to the master bedroom. The master bedroom included a king size bed, a dresser and a big screen TV on top of that. I slept well in the the bed and the storage, along with the closet, was sufficient. The master bath, which opened off the sleeping area, included a sink and whirlpool tub. Beyond that was a door leading to the private bath area with another sink, toilet and shower. On the other side of the living area was the second bedroom which had two queen beds and a large screen TV. In the hallway to the second bedroom was a standard bath and the closet with a washer and dryer. 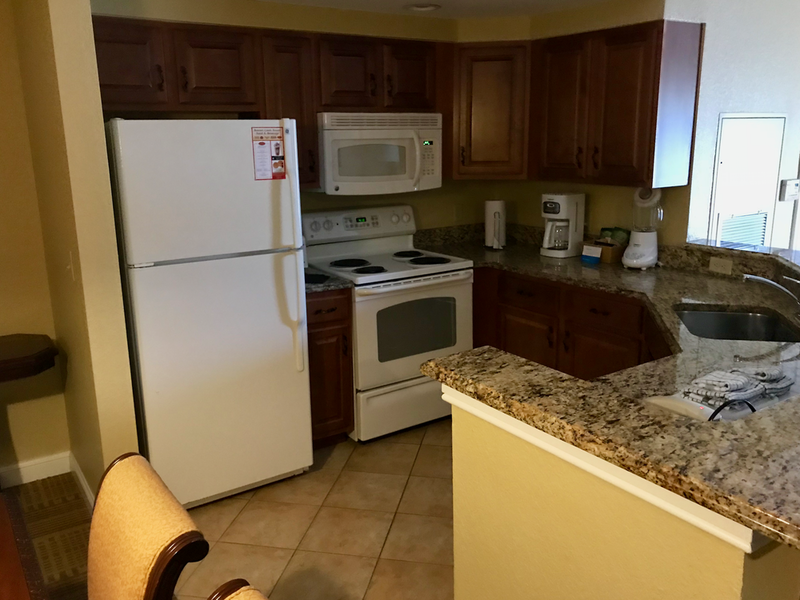 Our two bedroom condo at the Wyndham Bonnet Creek Resort was very spacious and offered all the comforts of a home. We lacked few amenities we would have had back in Atlanta. I found the unit very relaxing and it was large enough to afford down time despite traveling with three rambunctious boys. Making the property even more attractive were the numerous on-site amenities. I will review those in the next installment of this series.